Data Center Frontier • Charting the future of data centers and cloud computing. Charting the future of data centers and cloud computing. 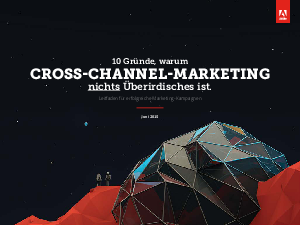 > Adobe > 10 Gründe, warum Cross-Channel-Marketing nichts Überirdisches ist. 10 Gründe, warum Cross-Channel-Marketing nichts Überirdisches ist. Marketing is changing. The traditional model, which saw the customer path as a linear funnel, is broken. Today, customers follow whatever path they want, and you’re expected to reach out to them on their terms. And it’s more than simply blasting them with messages through every channel you can find. Your customers expect you to be there when they want you and to back off when they don’t. They expect you to remember what they told you at one point and anticipate their needs at another. Identify the data you need to map your customer’s journeys. Coordinate channels and use their strengths to deliver the best customer experiences. Apply technology to build customer relationships, improve loyalty and increase ROI.